Israel Security Agency (ISA or Shin Bet) head Yoram Cohen may have claimed Tuesday after the Har Nof attack that Palestinian Authority (PA) Chairman Mahmoud Abbas "isn't inciting terrorism" - but that appraisal is completely wrong according to Abbas's own adviser. Palestinian Media Watch (PMW) revealed on Tuesday that PA Supreme Sharia (Islamic law) Judge and Abbas's adviser Mahmoud Al-Habbash appeared on official PA TV on November 5, after several attacks and hours before another one in Jerusalem that left two dead, where he clarified that Abbas is indeed inciting terrorism. Al-Habbash used the term "ribat" meaning a religious war or conflict to defend or reconquer land defined as Islamic in describing the recent wave of terror attacks sweeping over Jerusalem, tying the terror to the status of the Temple Mount - the holiest site in Judaism - where the Jordanian Waqf (Islamic trust) continues to wield de facto control and forbid Jewish prayer. "First of all, allow me to say that we kiss every forehead, every hand and even every foot that carries out ribat at the Al-Aqsa Mosque and in Jerusalem...We are behind them. The leadership is with them...we are with them in every movement, in every action and every deed, and we welcome what they are doing at the blessed Al-Aqsa Mosque," Al-Habbash said. 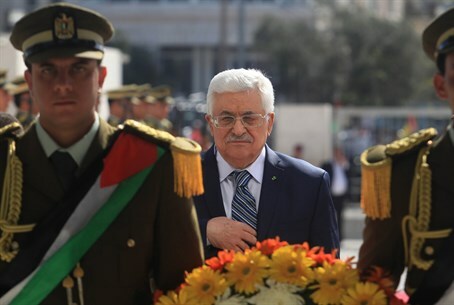 Referring to Abbas's speech in mid October when he called to block Jews from "defiling" the Temple Mount by "all means necessary," Al-Habbash noted "a few days ago, President (Abbas) greeted them, reinforced them and requested more ribat from them." "This statement may have angered the Israelis and the occupation, that the President is inciting the Palestinians from Jerusalem to ribat. Yes, we are inciting the people in Jerusalem to ribat. Ribat means to protect and to hold on to your ground," said Al-Habbash in an admission of incitement. In his speech, Abbas said "we must all carry out ribat" so as to prevent Jews by "any means necessary" from entering the Temple Mount, because "they have no right to enter it. They have no right to defile it." PMW documented how a clip of this part of the speech was given heavy rotation on PA TV, and how the call for violence bears a close resemblance to former PA Chairman Yasser Arafat's call for the 2000 Second Intifada.